The Dorset Waste Partnership (DWP) is asking residents in Stalbridge for their help in catching a serial fly-tipper who has been dumping white carrier bags of empty cans along a stretch of the A357 at Spire Hill. 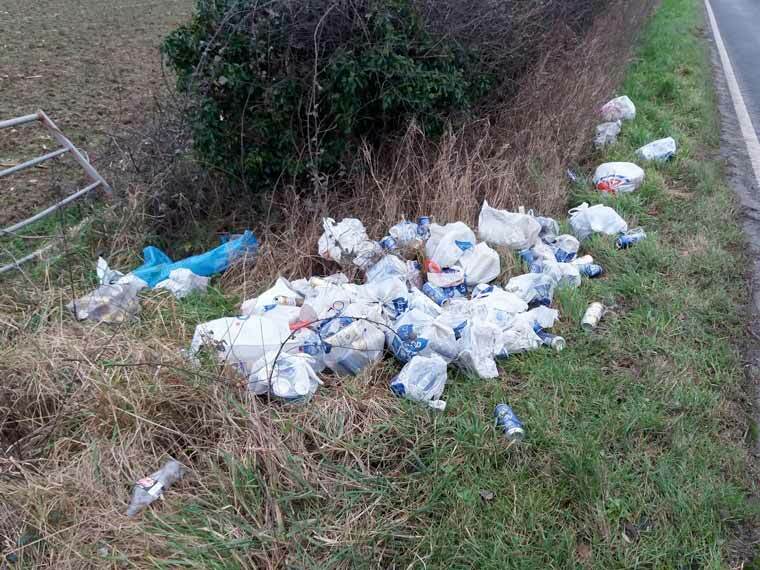 Enforcement officers at the DWP are currently investigating the spate of fly-tipping incidents that have taken place over the last six months along the stretch of the A357 at Spire Hill where white carrier bags of empty cans have been dumped. The bags appear in the mornings, usually between 7am and 7.30am. Despite this section of road being busy in the mornings with people travelling to work, the verges are littered with these cans. DWP enforcement officers cleared the litter recently and collected at least 1,000 cans. But despite their clean-up efforts, the bags have continued to be dumped. Sturminster Newton Town Council is also aware of deposits of similar rubbish around the town at various locations, but the A357 at Spire Hill remains the worst affected. If you have witnessed any littering taking place in this area, please contact the DWP by email: enquiries@dorsetwastepartnership.gov.uk or call Dorset Direct on 01305 221040. The DWP would like to thank Stalbridge residents in advance for their assistance.